I purchased a green 125 automatic with reverse ATV from powersportsmax. Ordering online was a very easy. Pick up was easy as well. We put it together in about 45min. Easy just follow the directions. The ATV is just the right size for my son which is 13 not too big not too small he loves it I love it he rides everyday great startup no problems. Just put this little guy together - piece of cake with no prior experience. My lady took it for a test drive (seeing that I am to fat to ride it : ) and this ATV is awesome! Much nicer than the stuff at the local bike shop - quality, features, etc. and at about 1/4 of the cost! I can't wait to buy from again. Our kid is going to love this thing! Thank you so much! So Far so Good. 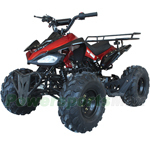 The ATV-V003 Utility is a great affordable little Quad. You have to know to expect a lot less than you would get with a 2 to 3 thousand dollar quad. If all you have is hills I would NOT buy this it is not built for hill climbs or HARD riding. The video sent with it says not to climb anything more than 15-degree incline. Even has a special K turn it teaches you for if you stall out going up a hill. However, if most of what you are riding is level surfaces BUY it now. Great value for the money. I replaced the oil after running it a half hour. the stock oil is pretty thin looking so I was glad I took that advice from some forums that I looked at. This has no oil filter so I plan to change the oil often. I bought a battery tender for it so it's always ready to rock. I personally am glad I assembled it myself. It took about 2 hours was very simple stuff to do. was able to make sure I used thread locker on anything that was not cotter keyed. According to the video they sent with the quad, it says this is for 16 or older. I would fully disagree. I bought this for my 7 years old he is doing awesome on it. It's all about teaching them right and using its safety features like the throttle limiter. I would buy again. I love the quad and am happy with the product. Overall, I am satisfied with the quality of the unit. The assembly instructions were not very good, but I was able to figure it out. When I upgrade the unit in two years, I am strongly considering purchasing another unit from your company. Thanks. Just delivered to my house today! I got mine un-assembled. About 3 hours to assemble in my garage with hand tools, going slow and sleuthing my way through it by dead reckoning. If you're used to figuring stuff out and turning your own wrenches, not all that difficult. 16 nuts out of the pack are the lug nuts (4 wheels x 4 nuts). That's about half of the hardware package right there. The rest you can figure out pretty easy and all the needed parts ARE there, including cotter pins for the castellated nuts on the tie rod ends. The included "tool kit" is... well... you already own metric sockets and wrenches if you're going to attempt your own assembly, so the fact that the tool kit is laughably worthless means nothing to you. Tires come with maximum rated bead-seating pressure of ~23 PSI in them out of the box. Yikes! Unless you feel like rattling your fillings out, you'll drop them down below 5 PSI for off-road use before you ever crank the engine over the first time. Watch the rotational direction on the tires- lefts and rights have to go on the appropriate sides. The rear fender support brackets have absolutely NOWHERE to bolt onto, frame-side. I thought there would be a set of holes in the rear rack bracket they would attach to when I finally got it installed but.... nope. Just take the supports off would be my suggestion. The rear fenders are plenty stout without them. Bouncing up and down on the thing in my garage the rear suspension spring & shock calibration feels pretty close to 'right'. The front suspension is a different story. Front spring rates are fine but the shocks are WICKED TIGHT. If you jumped it off a 3 story building you couldn't bottom out the front shocks. I jumped up and down, full-weight, on the front bumper and the resistance in the front shocks is ASTOUNDINGLY TIGHT. The "remote shock reservoirs" on the front shocks are also total fakes- they are just there to look cool- there is no fluid circulating/cooling through them. It goes without saying, replace the Chinese-made spark plug with a brand name plug and clean the carb before you run it (which I do with any Chinese-made engine on general principle for the last 15 years I've been rolling the dice with products like this). I could pick nits with this thing all day long but if it runs and lasts (they usually do, once properly sorted out), all will be forgiven. For $600 (+$200 shipping) you can't argue with what you're getting for the money. You're just not going to get anywhere near this price point on a 'brand-name' ATV. Thank you power sports for the bike it's amazing I love it.